Primo offers a wide variety of accessories so you can ensure your food tastes great! Primo Accessories are designed to fit and work perfectly with your Primo Ceramic Grill. Enhance your grilling and smoking experience with Primo’s selection of grill accessories. While there are plenty of grill accessories manufactured by various brands out there, we highly recommend using Primo grill accessories with your Primo Ceramic Grill. 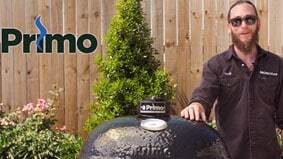 Primo makes one of the most versatile kamado grills on the market. Their accessories can expand your cooking options, giving you more room to cook or even changing the way you cook altogether. Extended Cooking Racks - Use these to create even more space while cooking. Primo kamado grills already offer a large cooking surface, but expanding the grilling space further increases the number of items you can cook at a time. Fire Box Divider - This Primo kamado accessory divides the fire box, allowing you to cook directly on one side of the grill while simultaneously using indirect heat on the other side. Using the divider also cuts down on charcoal usage and increases efficiency since you’re only filling one half of the fire box. Heat Deflector Plate - Heat deflector plates can be used to add versatility to your Primo kamado. By deflecting direct heat, you can turn your grill into an oven or low temperature smoker – allowing the heat to circulate around your food. Ash Tool & Cleaning Bar - The ash tool is a great way to clean out any leftover ash or charcoal after a cook. And instead of using a brush that can be ruined, the cleaning tool allows you to remove leftover food from a cook with ease.